As an architectural, and interior photographer, Keith Cooper makes extensive use of lenses with tilt and shift movements. 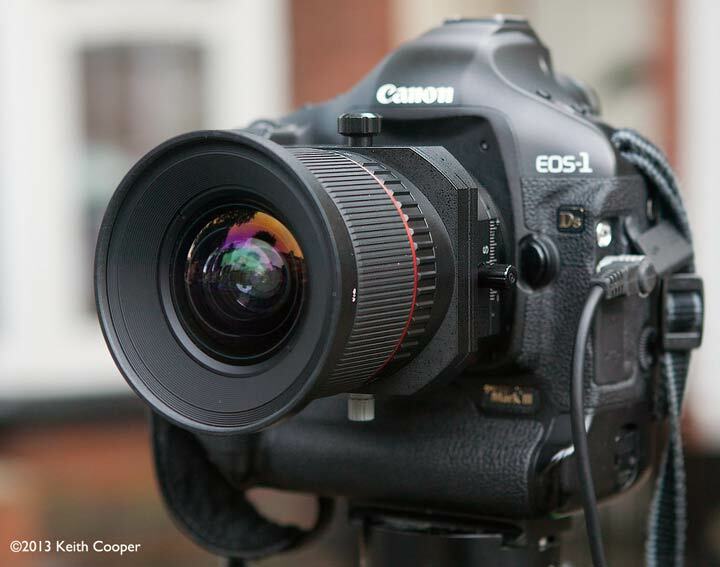 Unfortunately, such lenses (the Canon TS-E 17 and 24) are much too expensive for most people to consider. 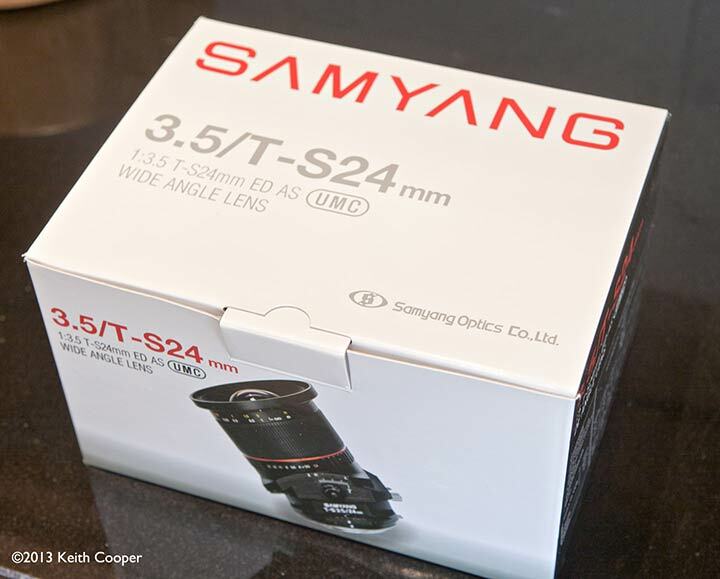 There is however, a new choice available, the 24mm tilt-shift lens from Samyang at less than half the cost of the Canon lenses. Keith has been lent one for a few weeks to test out, and looks to see how well it works. There are all kinds of special things you can do with such lenses, however it will take some practice to get the best results. 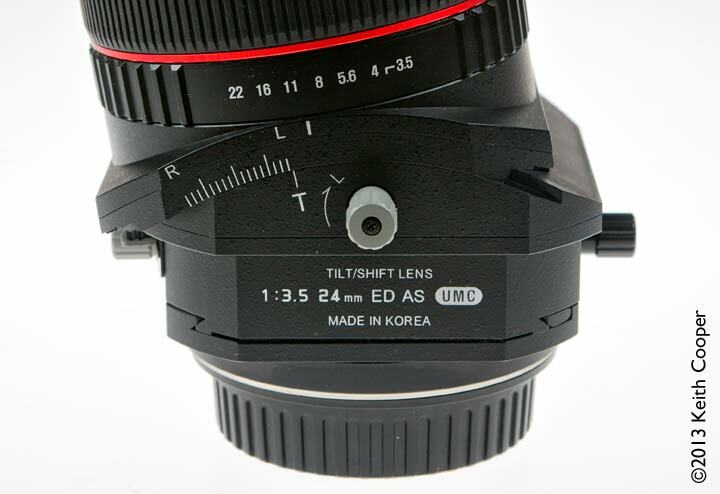 If you’re unfamiliar with the concept, I’d suggest having a read of the introduction to tilt and shift article I wrote about using the original Canon 24mm TS-E lens, some time ago. 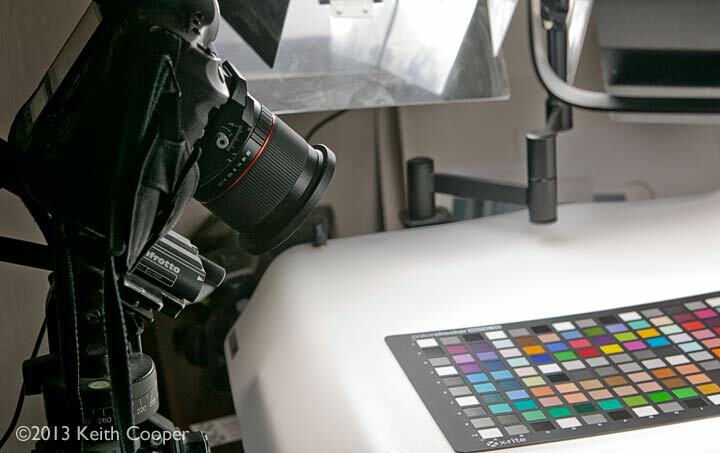 I’ve also written a recent note about why such lenses are vital for some of my professional work, when ‘fixing’ images in software just won’t cut it. 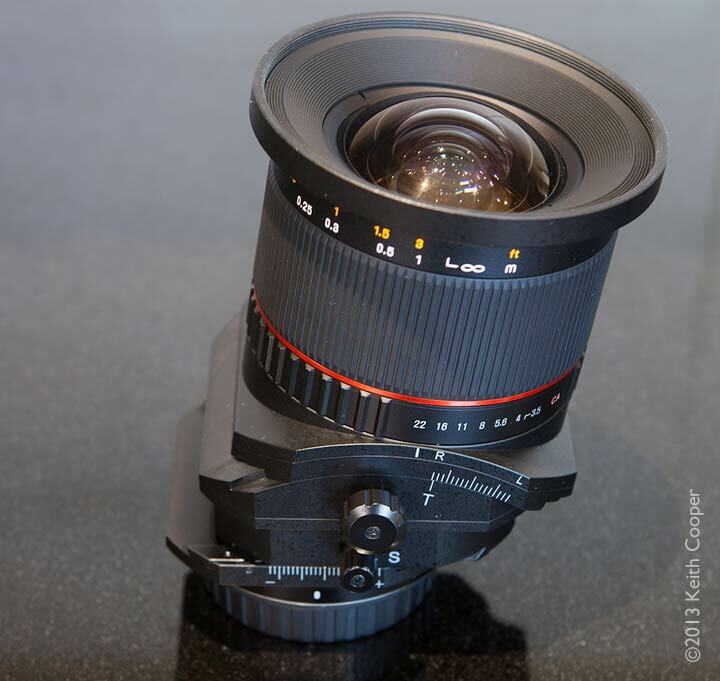 There is also a recent review of Samyang’s 14mm f2.8 lens. Such lenses are vital to much of my professional work, indeed I even use them hand held sometimes, although normally you’d expect to have your camera on a tripod, so as to take time to consider the best settings, and since they are fully manual, set both aperture and focus. You may find this lens appearing under a number of different guises (Rokinon/Bower) around the world. It’s made in Korea, with our UK one bearing the Samyang name. 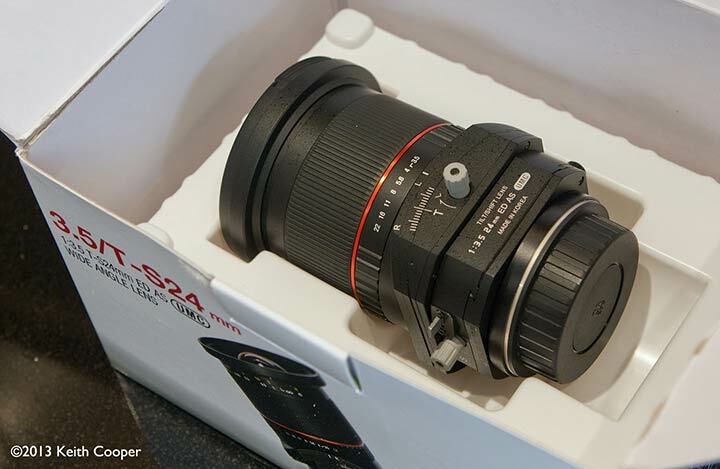 The lens comes with a soft carry bag and instruction leaflet, but without a lens hood (82mm filter size). 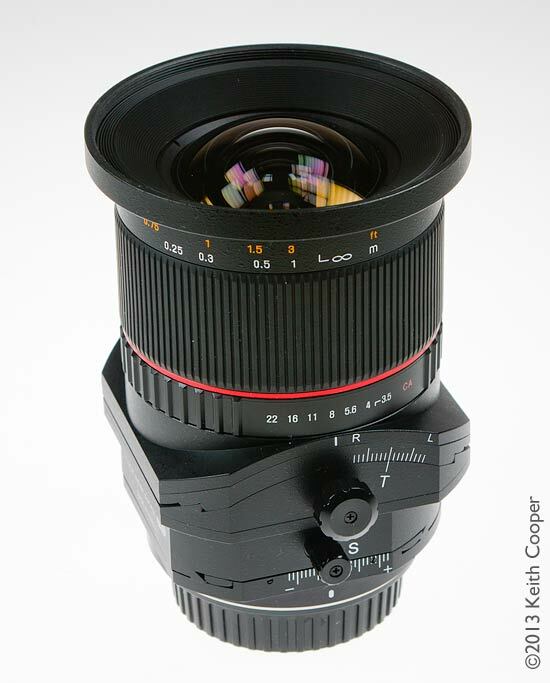 I can’t say I was too concerned by this, since most of the time I use my Canon TS-E24mm without one. If you want to use filters (I don’t) then look to get a low profile one, since at full shift you are in danger of introducing additional vignetting. The lens features a minimum focus distance of only 20 cm, so I’ve included some examples for close-up work as well as the more usual uses of tilt/shift lenses. Lifting the lens out of the box I noticed that it felt somewhat lighter than the Canon TS-E24 (II). It’s not of all metal construction, but didn’t feel at all inconsequential. It fitted firmly on the camera, with no slack in the mount. Nudging the front of the lens, whilst mounted as below, gave no feel of movement in the tilt/shift mechanism when locked. The default position of the lens movements is with them set 90 degrees to each other. 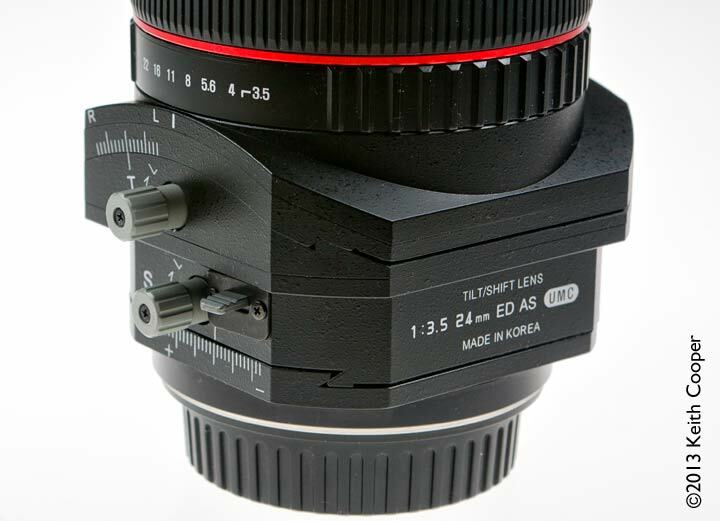 The view below shows how the mount moves side to side, whilst the tilt axis moves on its own, in this case tilting the mount towards our viewpoint. Move your mouse over the image below to get an idea of the effect. Below, the lens fully shifted and tilted after changing the tilt axis. The shift adjustment knob is smaller – mainly I suspect to avoid parts of the camera when using smaller ones. Note the locking tab under the lens ID. This rotates the mount only, so as to allow for vertical or horizontal shift. It’s solid enough, but is plastic. If I had the lens for use on my 1Ds, then I believe you can swap the knobs over, since I use shift vastly more than tilt at 24mm. Note – I didn’t try this, since it wasn’t my lens – could anyone confirm it’s possible? The other side of the lens shows the locking knobs and the axis adjustment locking tab (plastic). These both felt a little small for my liking, particularly the shift lock (bottom). As I mentioned, this lens is completely manual, so you need to set your aperture manually after focusing at a wider aperture. 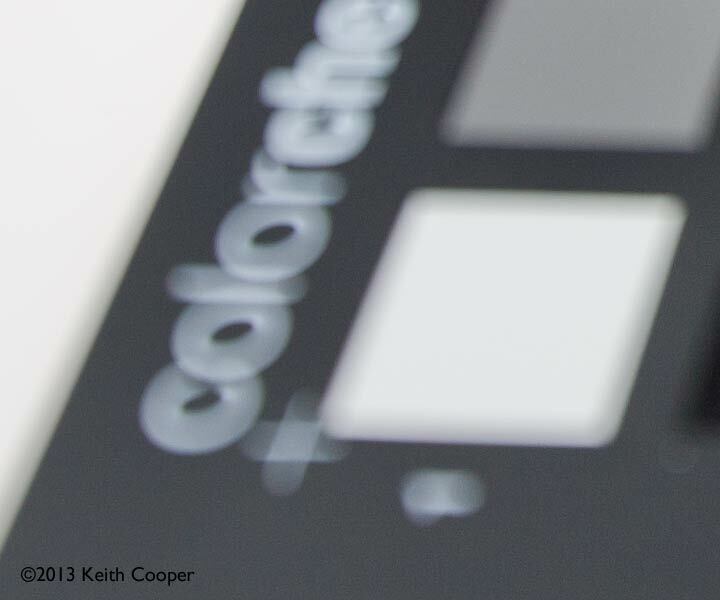 The six blade aperture does impinge on image quality if you are using extreme tilt for creative effects, but I’m minded to suggest that not many would notice, and you can always go to the full f/3.5 where the opening is circular. 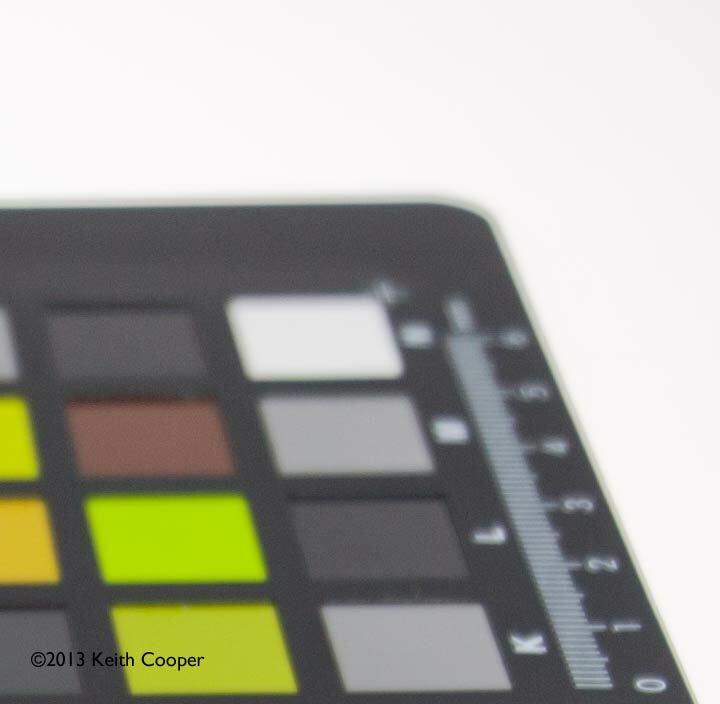 There is a depth of field scale on the lens, but I’d suggest that like most, it’s more of decorative value (see my article about why I don’t use hyperfocal focusing for much more about this). In the shot below, you can see how the smaller shift knob could make adjustment just that bit more fiddly. In this instance I’m just looking at vertical shift movements (aka ‘rise’ and ‘fall’). I’m focusing with live view and have a cable release for extra stability. 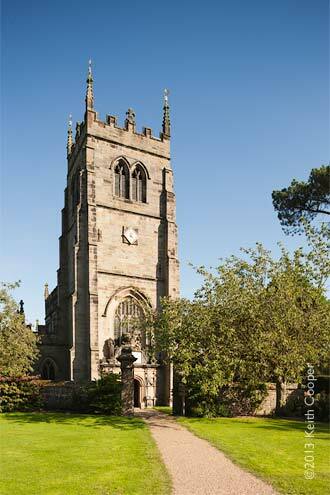 This view of the mid 17th century church at Staunton Harold is taken at full vertical shift. 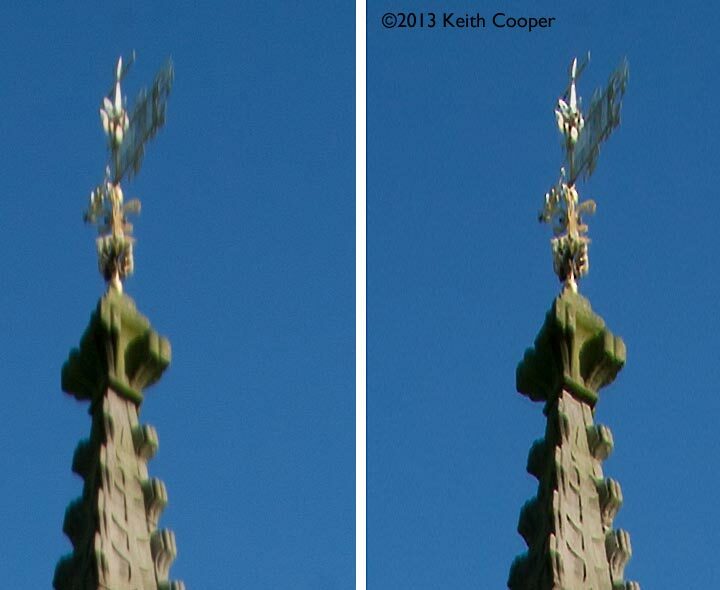 The lens does show vignetting (at f/11) which, because of the shift, is concentrated in just the top of the image. 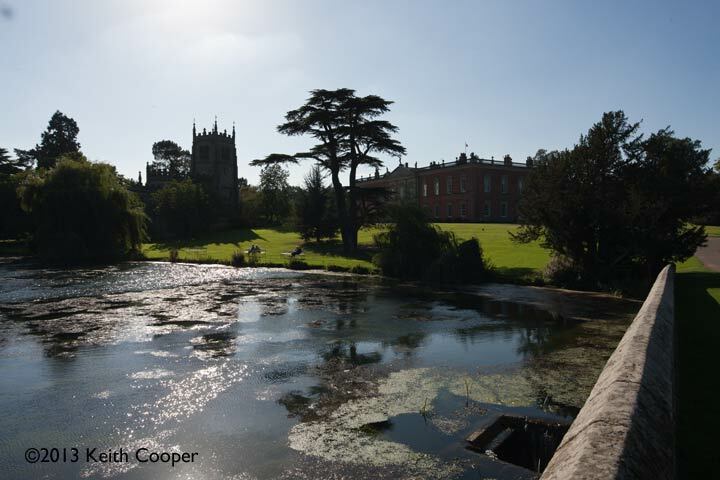 Fortunately this give the effect of a slight graduated filter, which in this instance is no problem at all. For metering, shift will usually mess up your camera’s exposure calculation, so meter at no shift, and work in full manual mode. 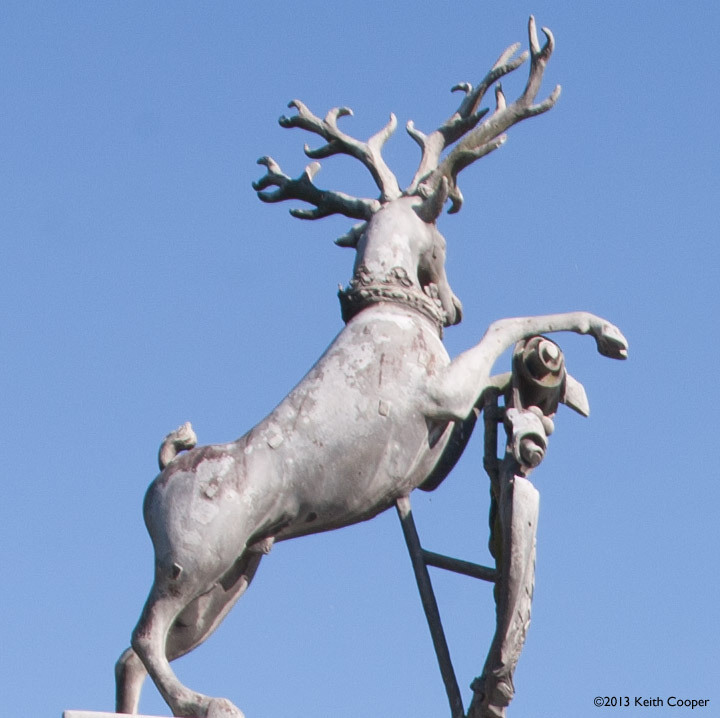 At the top of the frame, there is some distinct distortion, but in this case it was easy to fix, applying a few pixels of motion blur correction. Applied to a layer with Focus Magic and then lightly brushed in, I was surprised by how effective it was. However, the blur type and amount varies over the frame, so it won’t always be this easy. The lens is moderately resistant to flare in bright light, but direct sun will (like most lenses) seriously reduce contrast in some areas. Move your mouse over the image below to see the effect of using my hand to shade the front of the lens from direct sun. This is taken hand-held, so hence the slight movement and one of my fingers just making the corner of the frame. At f/11 I believe. 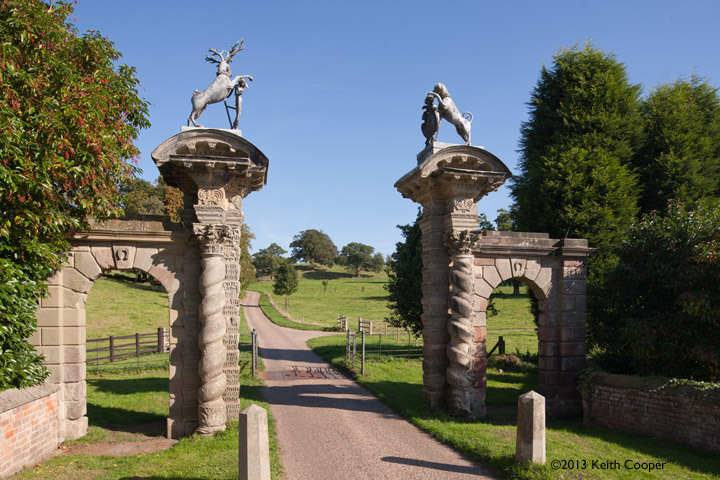 Looking the other direction, this view of the gateway shows one reason you use such lenses for structures – a few mm of ‘rise’ allows me to compose the view, knowing that what I see in the viewfinder is what I’ll get. At f/11 again, with full resolution 100% crop below. An important concept to grasp with lenses like this, is the image circle. Think of using a magnifying glass to cast an image of a scene on to a sheet of paper. If you’ve ever tried this, you’ll have noticed that the best quality image only extends so far from the central axis of the lens. In normal lenses, the circle of ‘best quality’ is designed to fully cover the sensor, and not a lot more. 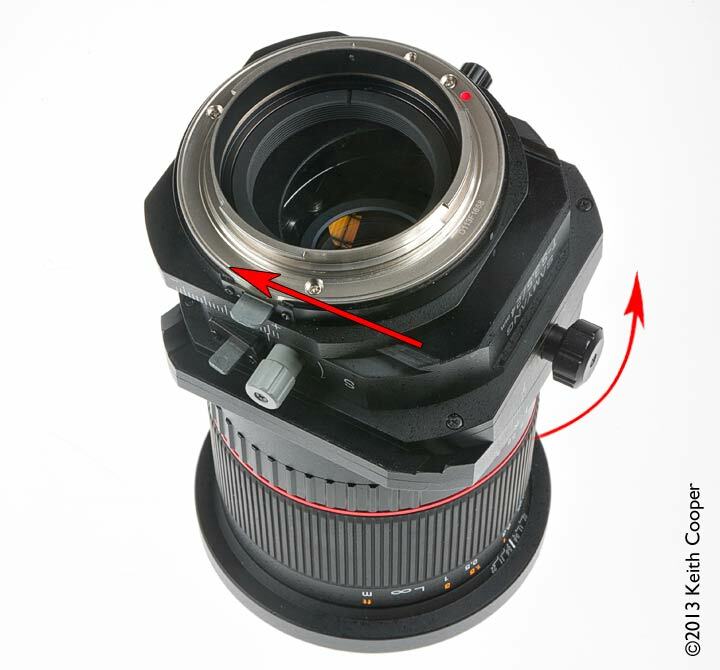 With shift lenses the circle is larger, so the sensor can be placed at different parts of the circle (this is what you are doing when shifting the lens). The upshot from this is that you can take multiple images and stitch them together, to give the equivalent of using a larger sensor. 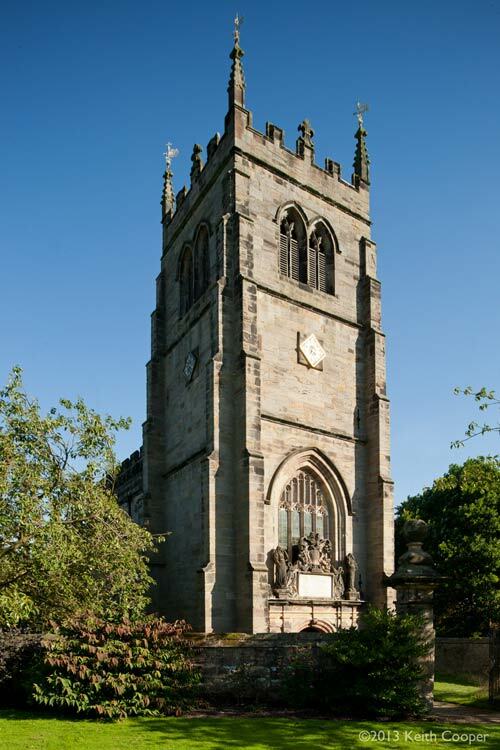 The two images are opened and stitched with the Photomerge option, giving the composite image you see below. Ideally, the lens should be kept fixed and the camera moved up and down. This eliminates parallax errors. There are numerous ways of doing this, such as a sliding plate for your tripod head. However, except for close-up work, I’ve never found it to be a serious problem. 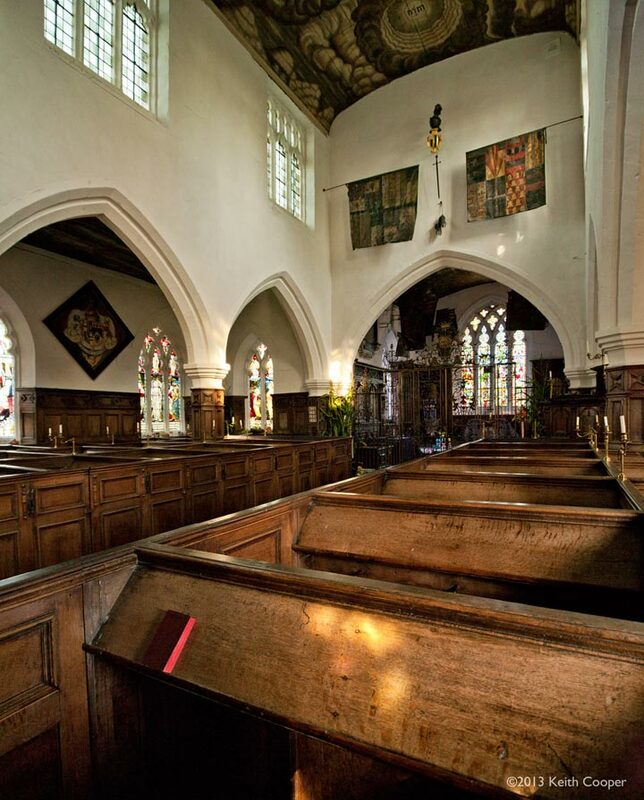 The shot above was hand held, resting on a pew. It’s possible to combine tilt, with shift for such images, you do need to allow for movement of the tilted focal plane though, if your lens moves. 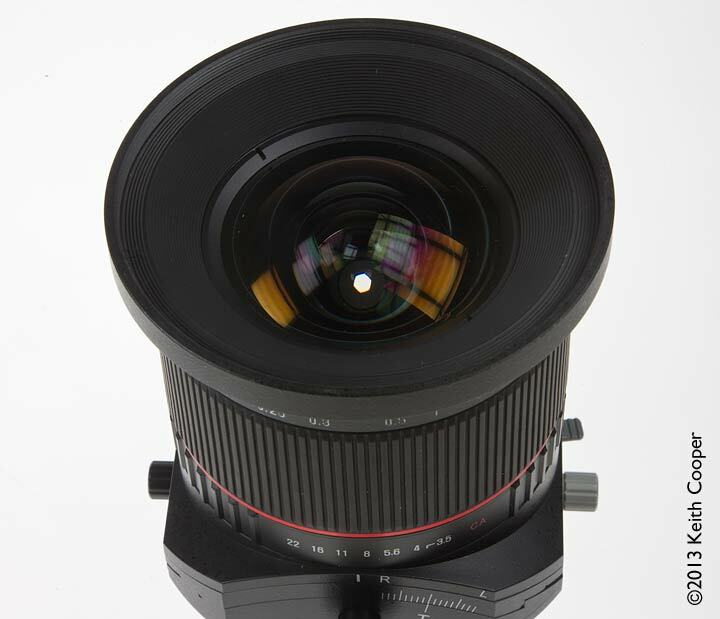 Measuring lens performance for a wide lens like this is not easy, so do take care before drawing too many conclusions from tables of measurements that you might see. 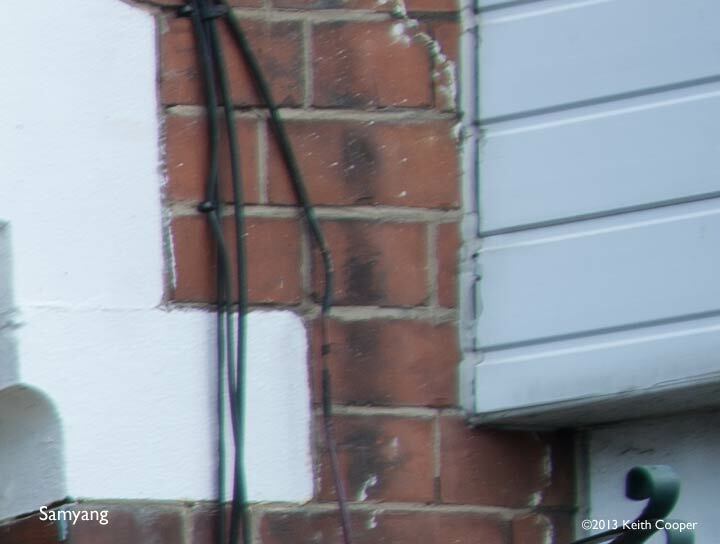 Move your mouse over the image below to see the version from the much more expensive Canon lens – the distortions should be quite evident in the horizontal and vertical lines. Please note that the Samyang shot was taken about a minute apart from the Canon one, so the light had changed, giving slightly deeper shadows. It’s the geometry I’m trying to show in this instance though. 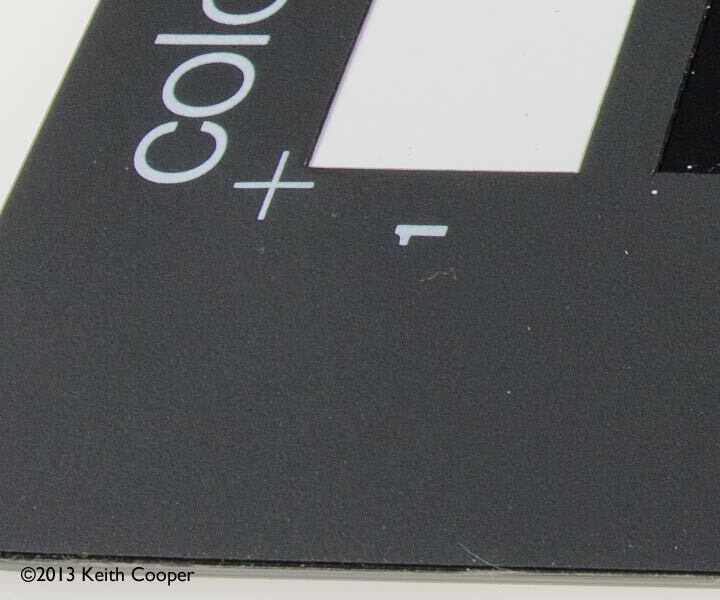 A 100% crop in the far corner certainly doesn’t look too bad (remember that this is at maximum shift). Mouse over image to compare. To my mind, the biggest issue for using this lens for my architectural work would be the distortions. You can’t use normal image correcting software with shift lenses though. 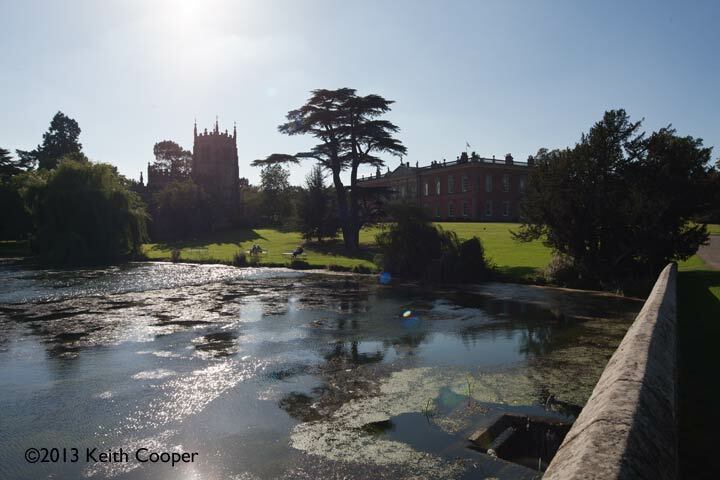 However, as I’ll show in a bit, all is not lost, there are techniques you can use to ‘fix’ things – just make sure you noted down how much shift you used when taking the photo. The lens allows just over 8 degrees of tilt. I’ve written a detailed article showing what this does to the image you capture, and included some tables you can print off to make using tilt a lot easier. I use tilt with a lens like this mainly to position the plane of focus along walls, floors or ceilings, in my architectural work. 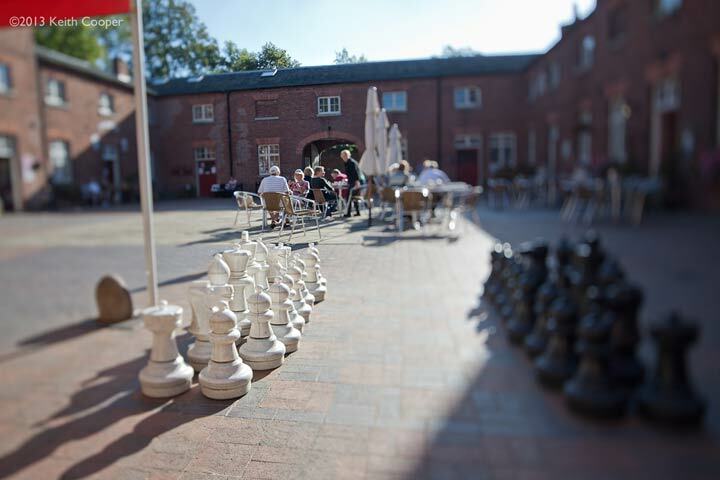 One other use you’ll find is to create ‘miniature world’ type images, where the plane of sharp focus is quite obvious. 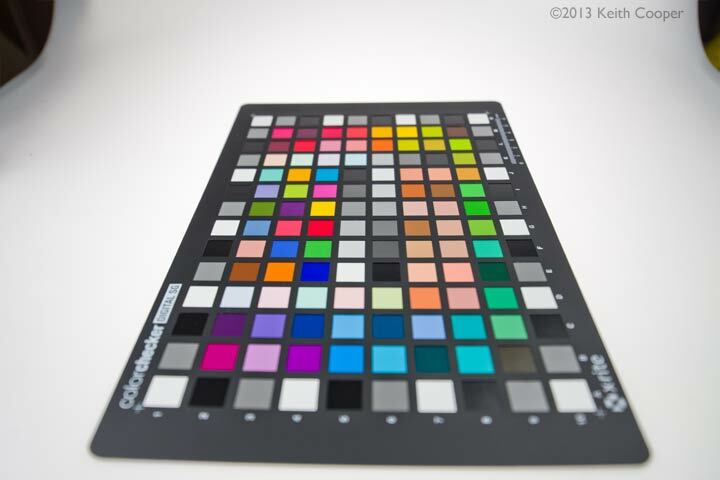 The picture below is taken at f/3.5, so as to show the out of focus areas. 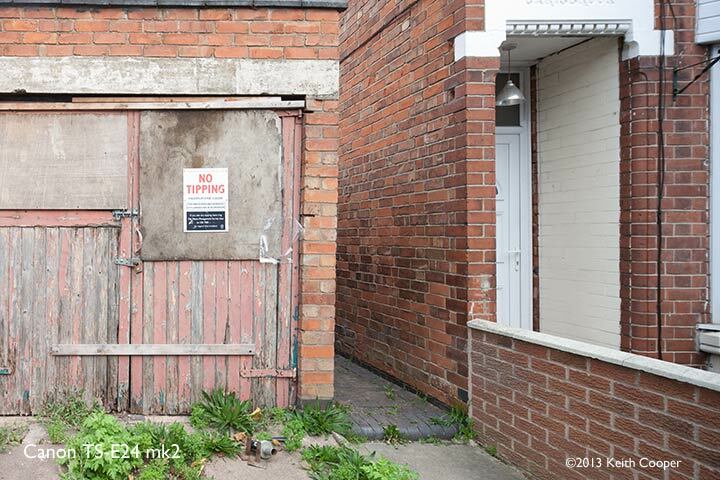 I’m convinced that it’s shots like this that lead to a ready supply of tilt/shift lenses in the ‘used’ market. People buy the lens, try this sort of stuff, tire of it, wait a year and then sell the lens because it’s sat unused for a while. 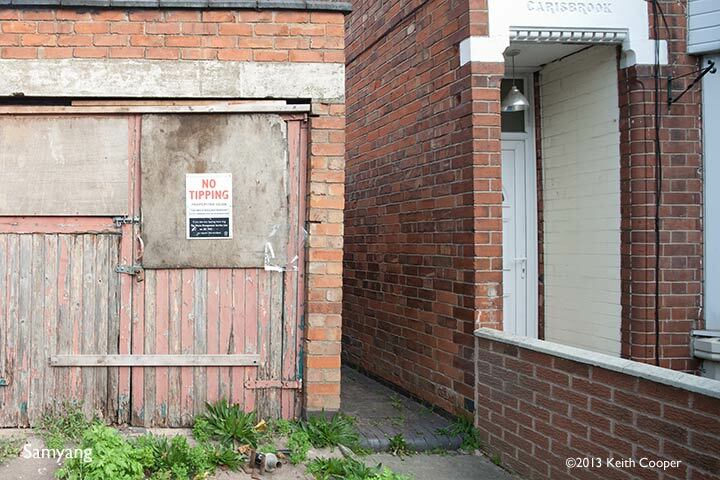 A more practical use (IMHO) is to use tilt to move the focal plane along an object tilted away from you. I’ve written a short article covering how to optimally find the required tilt and then focus the lens in this case. You can see how the lens is tilted 7 degrees downwards in this instance. 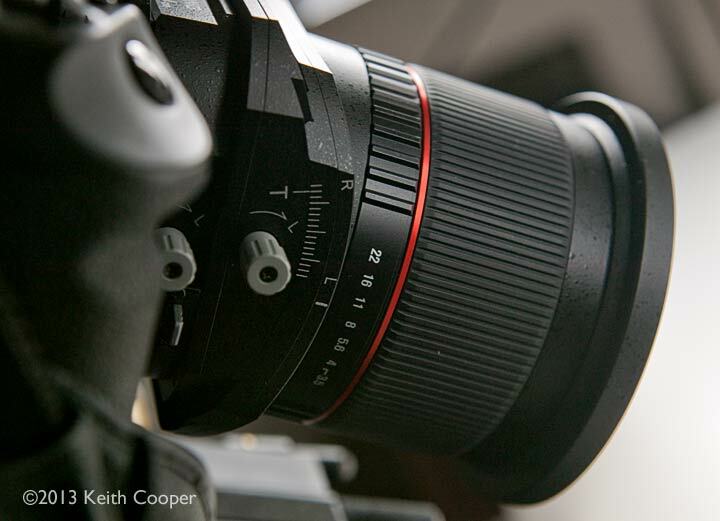 Want a longer focus shift lens? 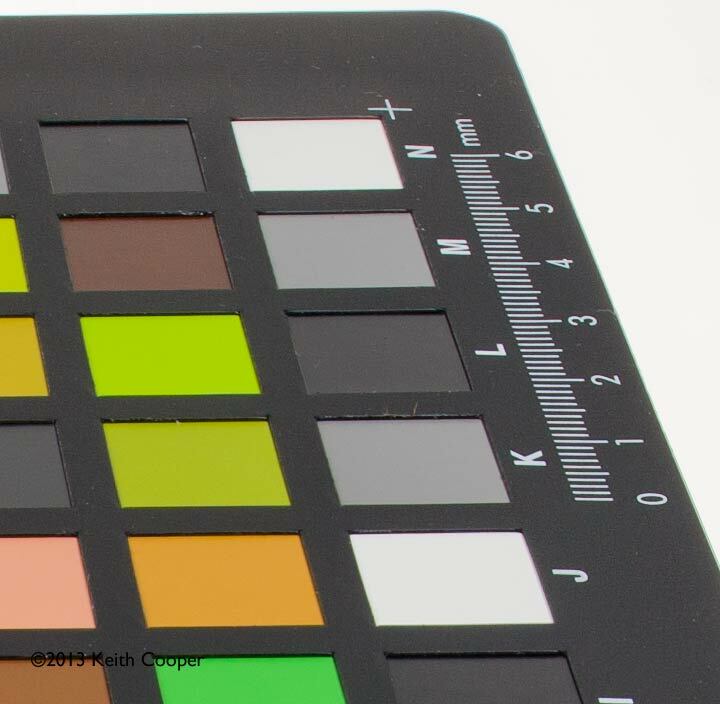 I wasn’t able to test it, but I suspect that a focal reducer on a mirrorless camera body, with a crop sensor would work fine too. If anyone tests this – please do let me know? 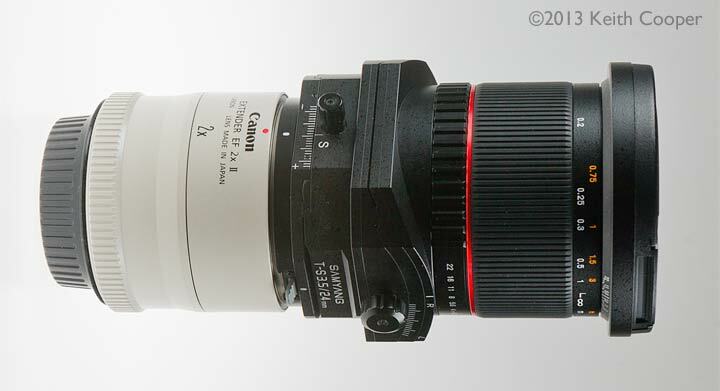 The lens will also focus closer with extension tubes. 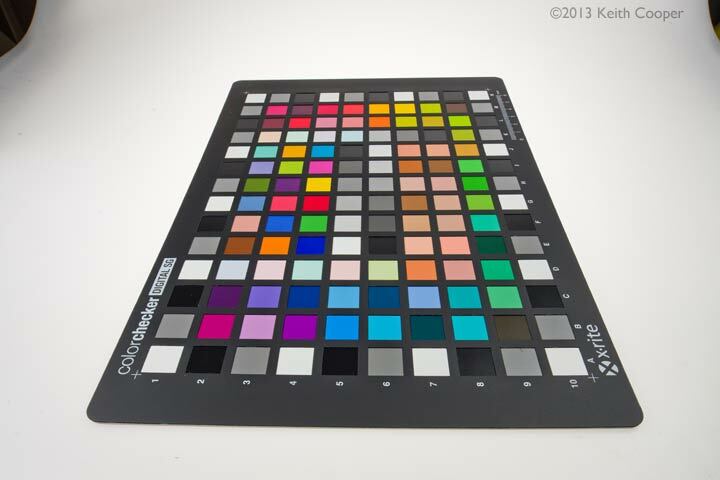 The software assumes that the central optical axis of your lens is at the centre of the frame. But, if you extend the canvas size of you image, opposite to the direction of shift, this new image has the lens optical axis at the centre of the new extended canvas. 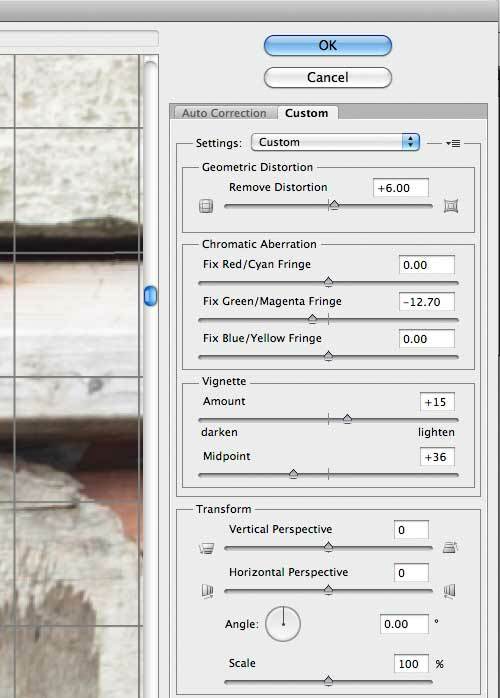 Now you can apply lens corrections, for distortion, chromatic aberration and even vignetting. Move your mouse over the image to see the effect. 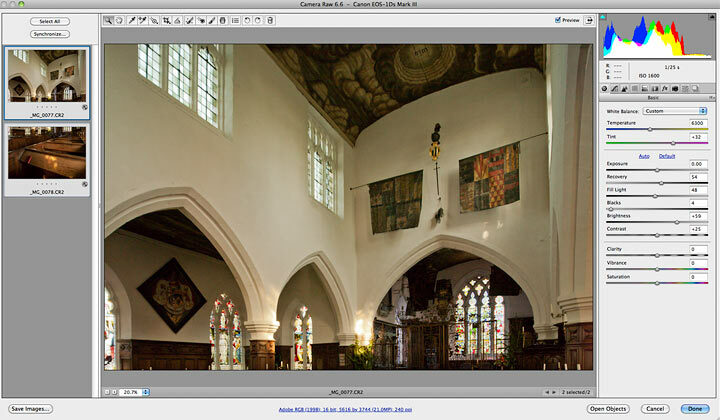 I’ve shown some more details of the canvas extension technique in my first tilt/shift article. You do need to have remembered to note down the amount of shift you used. Update: Samyang now offer a number of .lcp lens correction profiles for their lenses for Photoshop/LR [Samyang download] Note that this does not address the shift issues outlined above. 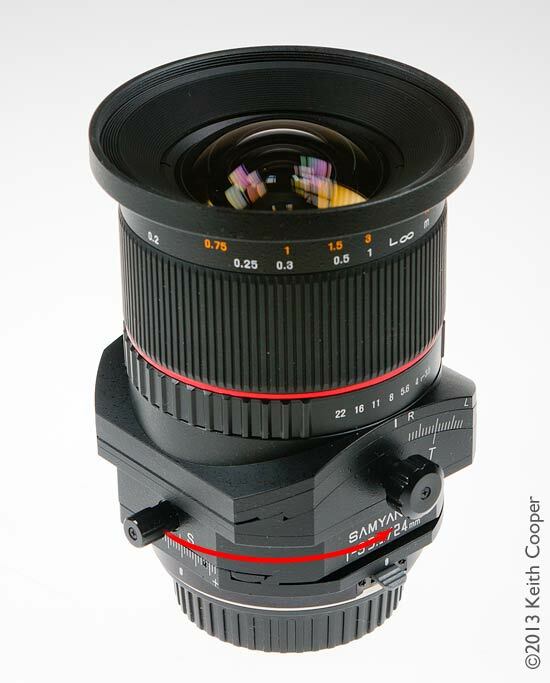 A very useful lens – but then again, a 24mm tilt/shift lens has been an important feature of my camera bag for several years. Could I use the lens for my work – yes for much of it. 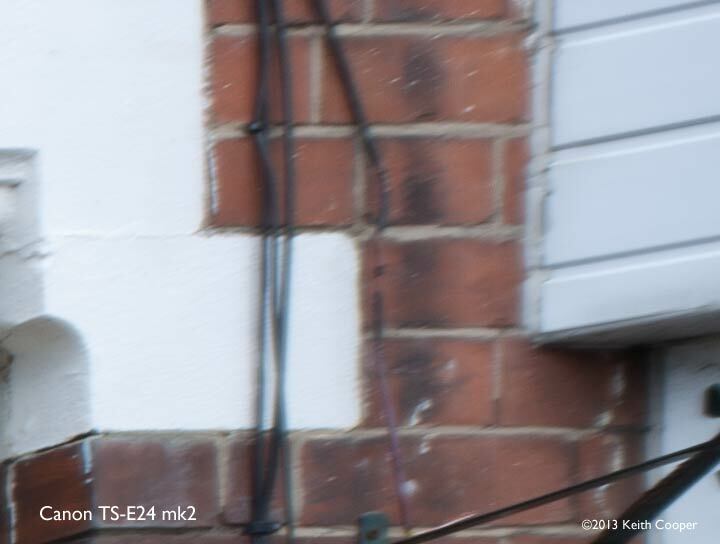 In some respects it’s better than the Mk1 Canon TS-E24, although that does have electronic aperture control. The lens is of good, but not outstanding quality, but once again I’m used to using the much more expensive Canon version. Looking at some published performance numbers suggests that at a typical f/11 setting, you are going to see real world resolution on a par with Nikon PCE and Canon TS-E lenses. Do be careful to keep direct sun from hitting the front of the lens, the drop in image contrast and flare is quite noticeable. Similarly if the prospect of no auto mode or metering when shifted causes concern, then it’s time to learn more of the basics of photography – your work will benefit greatly, and regular use of such lenses will make you pay much more attention to composition. Despite being an all plastic bodied lens, it’s robust and solidly built, but to my mind, could be improved in a few areas. The control knobs feel too small – it would be nice if larger versions were available to fit, if your camera could take them (avoiding protruding parts of the camera body). My biggest practical annoyance was the way that the shift lock knob quickly worked loose from a tight but moveable setting, to completely free movement. This led to the lens dropping to one extreme of shift under the influence of gravity. The mechanism could do with a much smoother movement setting with more friction. The small locking levers are plastic, so some care is needed with them. I’ve heard it said that the Canon TS-E lenses are easily damaged by rough handling, such that for lens rental organisations, they are a lot of trouble. 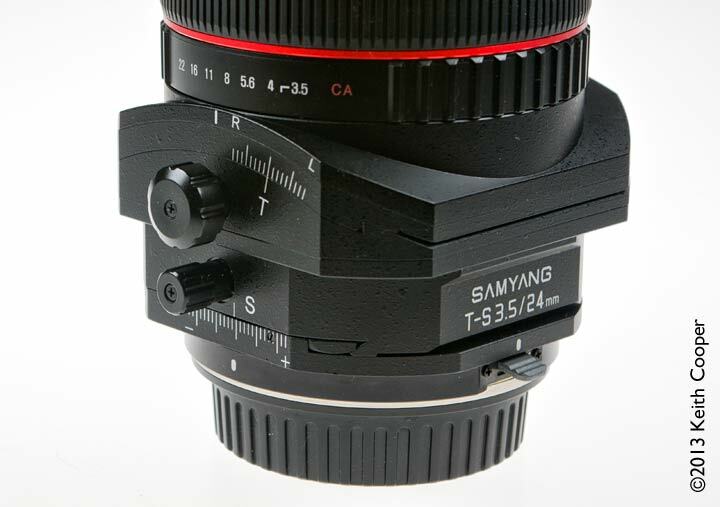 If that’s so, then the more lightly built Samyang lens could face problems. BUT, and it’s a big but… I’ve never had the slightest problem with the Canon lenses, and apart from the slack locking knob, faced no problems whatsoever with the Samyang T-S 24mm f/3.5 ED AS UMC Lens. It seems that if you treat your kit well, and not like a rental car, then allegations of poor reliability may be more than a bit premature. A lens hood would be helpful, although perhaps of less use on such lenses, but you do at least get a soft bag in the box. 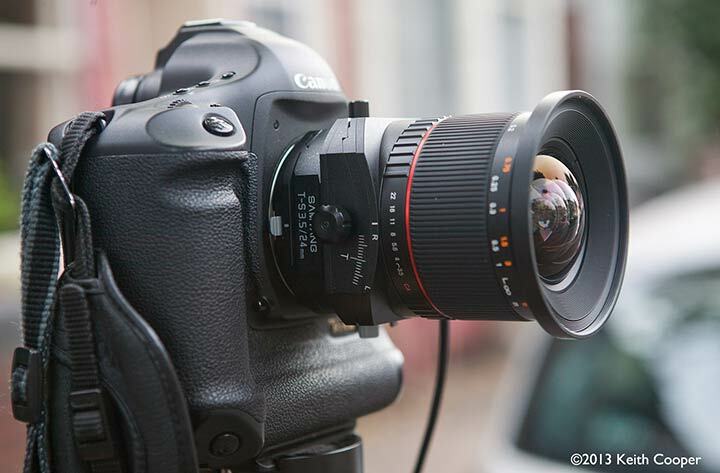 The range of lens mounts that this lens is available for, means that many more people can experience the flexibility that camera movements can give to your photography. Don’t believe that lenses like this always require the slower more methodical tripod based approach for your photography. I’ve just returned from a work assignment travelling round the UK photographing wind turbines in farmers’ fields. The two most used lenses were my 17mm and 24mm shift lenses – all hand held. Sure, for most of my architectural work, a good tripod is essential, but lenses such as the Samyang T-S 24mm f/3.5 ED AS UMC Lens offers so much more, if you are prepared to push it. We make a specific point of not selling hardware, but if you found the review of help please consider buying the lens, or any other items at all, via our links. It won’t cost more, but we do get a small contribution towards running the site (thanks! ).